While the Chinese government asserts that it protects religious freedom, a series of annual Pew Research Center reports on religious restrictions around the globe have detailed government efforts aimed at maintaining strict control over religious beliefs and practices in the country. Two recent events have brought this into focus: China’s agreement with the Vatican on how bishops are appointed, and restrictions China has placed on predominantly Muslim ethnic Uighurs. China has long wrangled with the Vatican over naming of bishops in an effort to maintain state control over the church. That dispute was back in the news last month when the Vatican agreed to accept the legitimacy of seven bishops who had been appointed by the Chinese government, breaking with its longstanding policy of not recognizing bishops unless they have been selected by the pope. Some Catholics and others have criticized the agreement for ceding to China too much control over church matters. 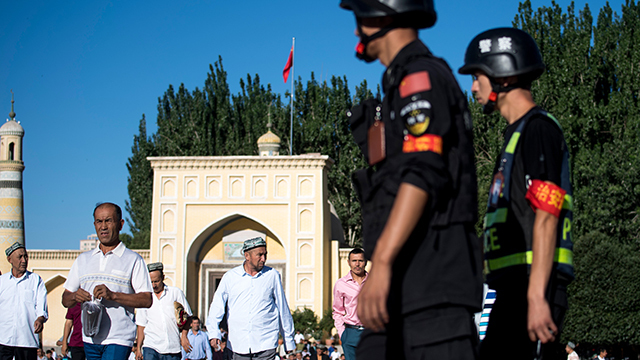 The deal with the Vatican comes at a time when China also has come under fire for reportedly detaining at least 1 million Uighurs in the country’s northwestern Xinjiang province. The government, however, denies the allegations and says their actions in Xinjiang are necessary to combat religious extremism and separatism. In each of the 10 years Pew Research Center has been tracking religious restrictions (2007 to 2016), China has been near the top of the list of most restrictive governments. In 2016, the most recent year for which the Center has religious restrictions data, the Chinese government was the most restrictive toward religious groups among all the 198 countries included in the study (it scored 8.8 out of 10 on the Government Restrictions Index). The Chinese government restricts religion in a variety of ways, including by banning entire religious groups and detaining their members. For example, the government has legally banned the Falun Gong movement, as well as several Christian groups. At the end of 2017, over 3,000 Falun Gong practitioners remained in state detention, with some reported deaths in prison. In addition, hundreds of members of other groups, including Protestants, Muslims, Buddhists and Catholics, remained imprisoned at year’s end. The government also routinely prohibits certain religious practices, destroys religious property and detains large numbers of people based on their religious beliefs and affiliations. For instance, since 2014, observers estimate that 2,000 crosses and church buildings have been demolished in the eastern province of Zhejiang under a targeted campaign to remove “illegal” church structures. And in the Tibet Autonomous Region and nearby areas, monks and nuns have allegedly been evicted from Buddhist monasteries. The more recent developments in Xinjiang province (with its sizable Muslim population) and elsewhere coincide with tighter government controls over the media, businesses and civil society. Moreover, the country’s president, Xi Jinping, has declared his intention to “Sinicize” all religions — an effort to strengthen control over religious groups by China’s ruling Communist Party. Although government restrictions in China are in the “very high” category, social hostilities on religion – those perpetrated by private actors and social groups – are quite low. In 2016, the country scored in the “low” category (1.3 out of 10) on the Social Hostilities Index, according to Pew Research Center’s most recent religious restrictions study. In other countries included in the study that have high levels of government restrictions, such as Russia and Egypt, restrictions on religion and social hostilities scores are often correlated, but China is an exception.